When dealing with scientific data it is essential to know the units of measurement in order to understand and present the information correctly. Likewise, in order to do computations with scientific data it is essential that software is able to convert data into a common unit framework. 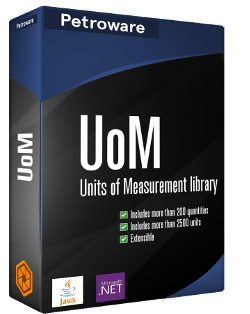 The Petroware UoM library is a convenient, extensible front-end to the Energistics Unit of Measure database. It contains definitions of more than 2500 units from more than 250 different quantities. The API is simple, well documented and easy to use, and the library is trivial to embed in any scientific software system. UoM is available for Java (Uom.jar) and .Net (Uom.dll). The library is lightweight (< 0.1MB) and self-contained; It embeds the complete Energistics unit database and has no external dependencies. Making a user interface units aware includes associating GUI components with quantities and then provide unit conversions, either per element or as overall preference settings. The typical approach would be to read these from a properties file during startup. Unit symbols should be regarded as IDs, and clients should never expose these in a user interface. A GUI friendly display symbol may be obtained through the UnitManager.getDisplaySymbol() method. As for unit aliases, it is possible for clients to supply their own specific display symbols through the UnitManager.setDisplaySymbol() method.